#11353 You just got your GMRS license, now you want your own repeater? Why does every new license holder want to setup a repeater? I would like to shed a little light on some of the important things to consider if you recently got your GMRS license and now want your own repeater. First thing to consider, are there any open well placed repeaters in your area that you are able to use? I can assure you most repeater owners want people to use there repeater. Owning several repeaters I can assure you all are welcome and encouraged to use my machines. Do you have access to a location to host your repeater? If your answer is your garage roof you should reconsider. Your garage roof will give you about the same coverage as simplex. Unless you’re on top of a mountain and all your users are at the bottom you will never be happy with this setup. GMRS is not as popular as one would like to think, unless your repeater covers 20 miles or more you may find you only have 1 or 2 users in the area. Unless you already have a group of friends together you may want to consider this before spending money on a decent well positioned site to install your repeater. So you found a nice high site and the price is right, all you need to do is get the repeater installed, sounds simple right? Some thigs to consider first and foremost are the costs because they can add up quickly. Are you on a commercial tower that requires a license and bonded climber? If so this could be by far your largest expense depending on your area. I have spent $600 to $1200 on a climber; I have had quotes as high as $2500 depending on the amount of work and heights involved. Keep in mind commercial sites require certified mounts, hard line cable, cable clamps, engineered grounding solutions and commercial grade antennas. 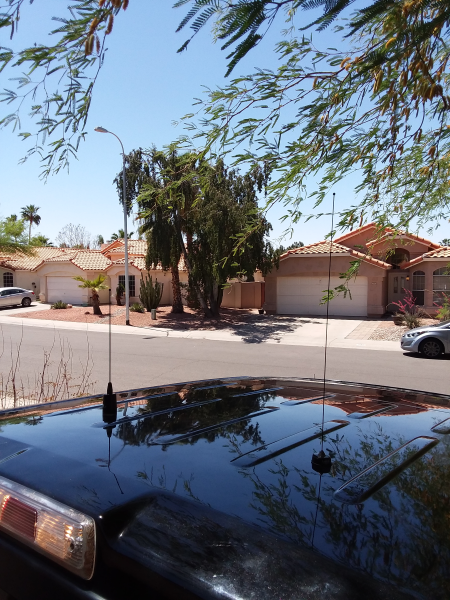 No tower owner is going to let you install a comet antenna and 200’ of braided shield coax. This brings me to my next point, the antenna. Because of the costs involved with climbers you will want to expend your budget on the antenna. Remember a $2000 repeater on a $200 antenna is going to work about as good as a $200 repeater. Whereas a $200 repeater on a $2000 antenna is going to work like a $2000 repeater. On my first repeater I was gifted use of a 150’ tower, I installed a DB-420 on the top and 160’ of 7/8 hardline. Total cost of equipment for the antenna install was $2500, with the climbers labor coming in at an additional $800. This left me with enough to purchase an old Motorola R100 repeater running at 25W. To my surprise it had 30 miles of coverage, all due to the cash spent on the antenna and waiting for a decent spot. Things happen, more so if you have an antenna 200’ in the air with a conductive cable connected to sensitive electronics. Antenna issues, feedline issues, repeater issues all cost money and I promise at some point you will have issues that need repair and require your money! It is my opinion that the GMRS community does not need another 2 to 5 miles repeater as it just becomes background noise. What use is a public listed repeater if somebody in a mobile can’t use it 5 miles away while moving or the portable coverage is only a mile? If after reading this you are still going to build a repeater for your garage more power to you, just don’t expect 20 people to show up if it only reaches a mile. As the owner of several GMRS and Commercial repeaters I can attest to the amount of money and effort go into my repeaters. I have only touched on the basics, if you add in any kind of testing services, duplexer tuning, addition of a combiner channel to an existing tower system, RF engineering, rent and insurance your costs can sky rocket. The best advice I can give any new licensee is to try and use the available systems in the area. Take the time to learn a little about what you’re doing and to assess the usability of the service before investing in a repeater for the sole reason of saying you own one. I have two of these radios and have done some preliminary testing. I am a ham operator, and a member of our local ARES/RACES and NET/CERT organizations. Baofeng has taken their UV82 radio and repurposed it for GMRS use. UV82 accessories, including the high capacity battery and AA battery pack, all work with the GMRS-V1. The radios are pre-programmed for the GMRS/FRS and GMRS repeater frequencies, with the repeater offset already set. 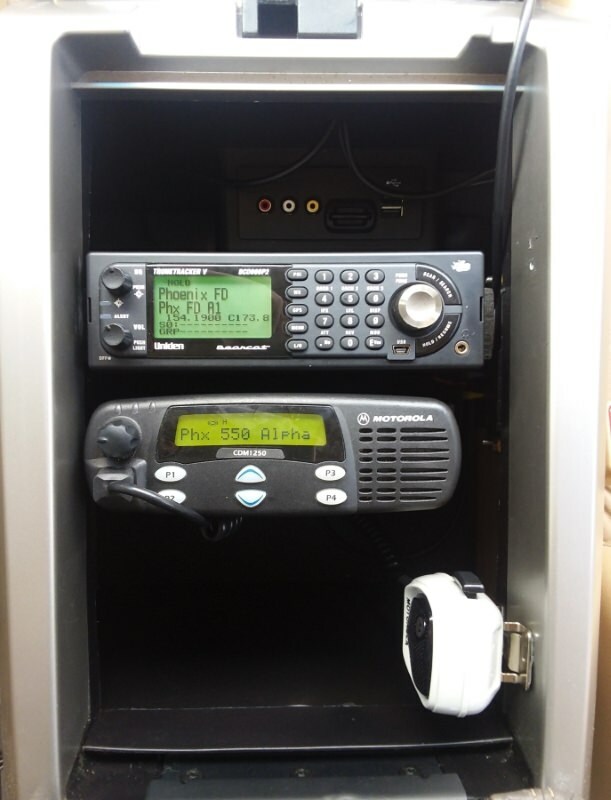 The radio will also scan the ham VHF/UHF bands (there are approximately 100 channels available), has a FM radio, dual watch and the rest of the UV82 and UV82HP features. Advertised power is 1W/5W. The radio is programmable through the keypad and CHIRP; I highly recommend the latter. Before testing the radios, I cloned one using CHIRP, and made some modifications, including adding the VHF/UHF emergency communications channels for my area. Note that the pre-programmed GMRS frequencies/offsets can not be changed and the radio cannot be programmed to transmit on any other channels. The GRMS PL tones, channel names, power level, and scanner inclusion can be programmed. Programming is straightforward, as is cloning a CHIRP image from radio to radio. In my test rig, I used an inline power and SWR meter and tested the units with both the stock antenna and a J Pole that that I with my VHF/UHF rig. 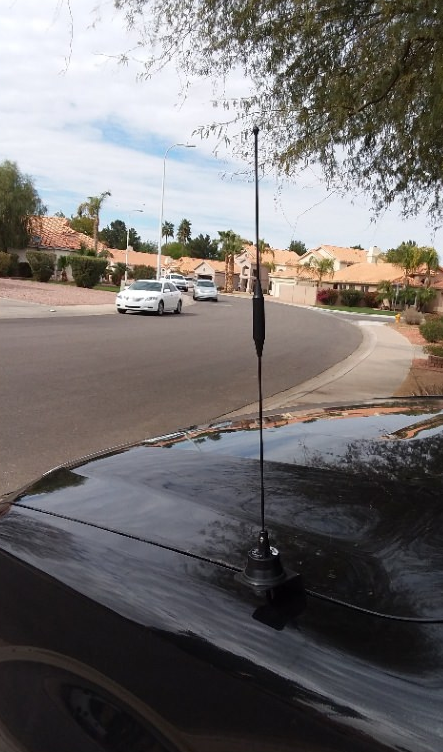 Using the stock antenna, low power performance in an treed, hilly urban environment is, as expected, less than a mile. High power performance was between one and two miles. I need to do more testing, with a j pole and a whip antenna to get better numbers. I don't have a local repeater to test against. YMMV. The audio is clear and undistorted. Features like dual-watch, two line display, transmit timer and scanning are handy to have, especially if you are used to using them on a ham HT. If you have UV82 equipment, the ability to swap batteries, antennas and the like is terrific. Scanning, like on all Baofengs, is usable but not fast and when scanning, the two line display does not stay synchronized. What I really like about these radios, other than 5W, interoperability with the UV82 and FCC compliance, is they can be set up, the keypad locked so the unit can't be accidentally reprogrammed, and handed to someone without a lot of experience. I am looking at them for NET/CERT team use and they will certainly become part of my family go bag. And for less than sixty bucks, including charger, microphone and battery, they are a real deal. #65 A Word of Caution - Posting Personal Info. We have seen that the Google, Bing, Ask and other search engine spybots are camped out here reading new posts. Just a word to the wise... use your discretion in posting personal or sensative information that could possibly compromise your personal safety, security, lead to identity theft, or give non-licensed individuals a way to access your radio systems. #9477 Finally ditched the mag mount and drilled some holes! 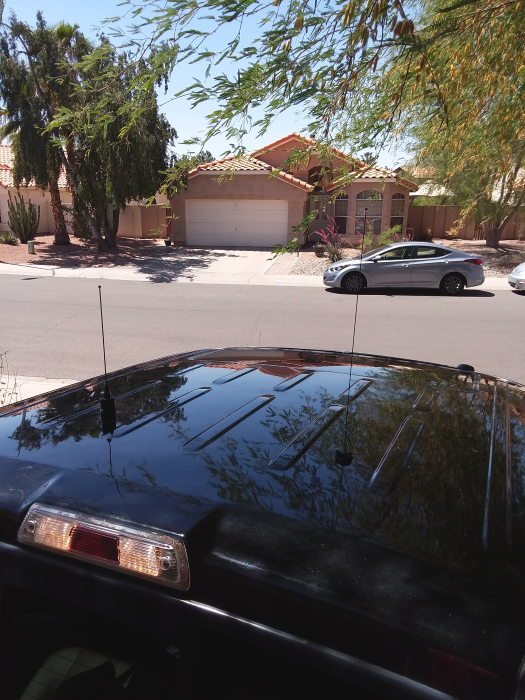 Being one of the last cool Saturdays left before summer hits here in Phoenix, I finally got around to drilling and mounting some antennas on the roof of my 2013 crew cab F-150 4x4, 3.5 EcoBoost. 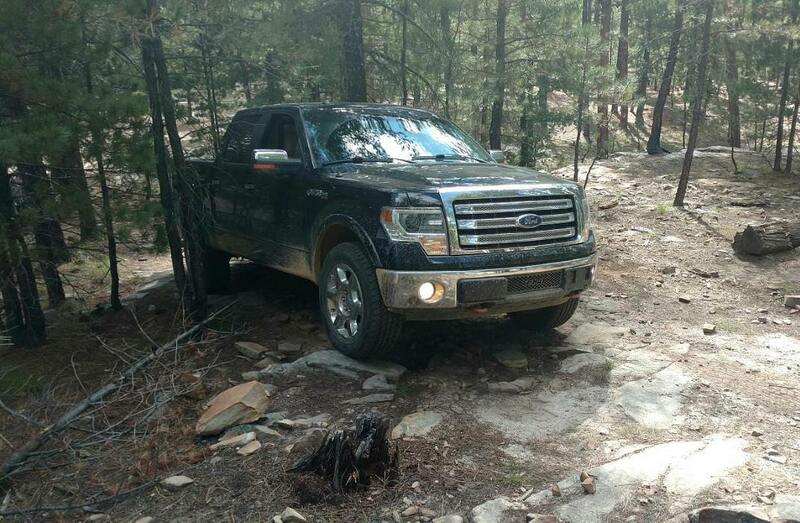 The truck has a sun roof which significantly limits antenna placement. 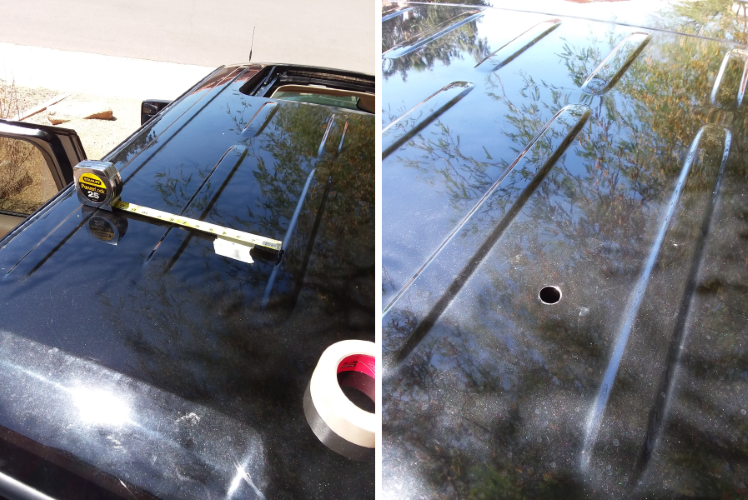 With the sun roof fully open, I was able to place both antennas 12" from the rear of the roof to clear everything. Not ideal, but it works MUCH better than the mag mount I had been using. Stretches of highway on my commute that were completely deaf to our local repeater when using the mag mount antenna I can now hit easily. 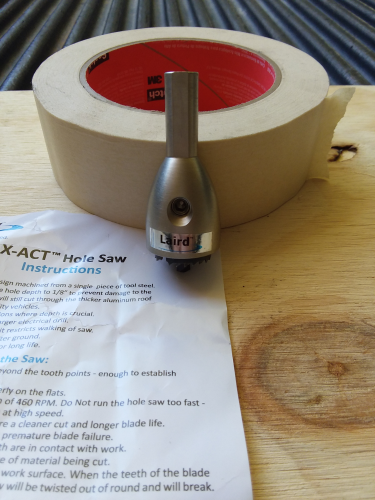 I picked up a Laird X-ACT hole saw from a local radio shop and it worked great. Holes marked and masked - measure twice, cut once! 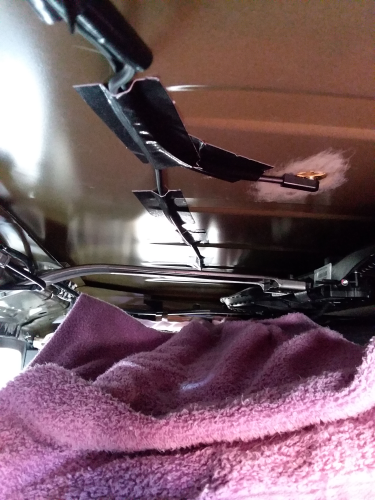 I got a great tip from a fellow AGRC member which was to put down a protective layer above the headliner when it was dropped down in order to catch all the mess from drilling and sanding; I laid down an old towel on top of the headliner before I got started. I used gorilla tape to keep the coax from flopping around, and ran both cables behind the rear passenger side airbag (super important! ), down the rear pillar and under the door trim up to the center console. Having an alternate means of longer range communications in times of duress or when commercial communications have failed for whatever reason. Folks are all the time asking me how I got a call sign with only three letters, 'cause all they hear is "WQW626. The last "U" is elided into the preceding "W" unless I enunciate the letters s l o w l y. Not GMRS but still UHF radio related and I know several other members own or service licensed part 90 systems. So I thought I would share a few photos from this weekends tower site repair on my business system. Last year I added this site to my Mototrbo IP site connect system, because of costs I cut a few corners and paid the price with an under preforming site. Today's project included installing the new repeater system, replacing the antenna, upgrading from 1/2 to 7/8 feed line and swapping out the 2' standoff for a 4'. Big thanks to my climber, he braved the 29 degree temps and completed the entire project in 4 hours. Yes that's him sitting out on the end of the 4' side arm installing the new antenna. I guess the side arm is now climber tested and approved! Not even with his 50 lbs of safety gear would you catch me sitting out there at 150'. I did some testing on the 50 mile ride home and the site is no longer under preforming. It has exceeded my predictions with15 miles of portable coverage, up from 2 miles. 5 AM Central Time, Saturday, January 26 - 14 degrees below zero with wind chill at 27 below zero. Colder at my Midwest location than in Fort Yukon, Alaska. Several years ago, the morning air temperature was 27 degrees below - a lady went out to her car to go to work, saw that one tire looked a little soft - kicked it and it 'broke'. Now, where did I put my golf clubs? Merry Christmas, Festivus or whatever holiday you celebrate, along with my best wishes for a terrific New Year! We hope that everyone has a Happy Thanksgiving holiday. Please use caution if you are traveling - especially in areas of the US that are seeing abnormally cold temperatures and freezing precipitation. Have a good day and be safe. with a Browning WSPBR10353 magnet mount and a BR-176-S 450-470mhz 5/8 wave 3Dbd gain antenna. He runs on Medium power and makes a great connection with our base/repeater. It has a good clear Rx & Tx (even with our 5yr old granddaughter with the mic) and has a easy to use menu. They only use the radio for talking to our family group, so it is kept keys locked on one freq set. after school (pre-K) on her ride home. So yes I love it!!! And it is a great GMRS radio, but like all of the rebranded to 95 conformity GMRS only units it is very basic compared to unrestricted units. I would recommend this as a good mobile unit. will I get flagged by FCC during the 3 days I need it? Being realistic, there is minimal possibility of causing harmful interference and obviously the FCC won't be sending jack booted thugs thru the door the second you key up. But considering this is a GMRS forum, nobody here will help you use any radios in any illegal fashion, on GMRS or any other band. The bottom line is that there is no scenario where you can use those Retevis RT5 (re-branded Baofeng UV-5) radios on the GMRS band (with or without a license) and be in full FCC compliance, as the radios lack the proper FCC type certification. #8525 Family use of callsigns. My family uses unit numbers, but not very often. Names work just as good. What's funny is that our youngest son takes this GMRS identification business more seriously than any of the rest of us. I will call him on GMRS as: "Hey Mike, it's Dad, copy?" He will respond with: "This is WQYM-Five Four One, unit 5 to unit 1, go ahead Dad." #5625 Must family live with you to operate under your license? I sure wouldn't want mine living under my roof. GMRS is for families. No test, covers your whole family. No tinkering, grab a pre programmed radio and go. The downside is that the FCC limits the equipment that can be used to prevent people from plugging numbers into a radio and causing interference. There would be a lot more confusing regulations to follow if the FCC started putting all kinds of equipment exceptions for various other services, which then creates more problems than it was trying to solve for a family jist grabbing a set of radios and going. My wife and kids are not interested in Amateur radio. This allows us all to communicate with few issues. #11294 Can GMRS repeaters be linked to the web like Echo Link for hams? How do you get in on this network? And are these point-to-point links, or some kind of national or regional network? We are using Asterisk as the server (running on a raspberry pi 3) and the RTCM made by micro-node. Cheaper hardware solutions vs the RTCM are available but require other configuration. I have not used any of the other hardware so I wont touch on that. I chose the RTCM for its single unit design and application specific properties. The interfacing with the RTCM is rather simple, I went with the MTR2000 repeater for reliability, full duty cycle and used market availability. Our group hosts its own local node server (Asterisk running on a raspberry pi 3) with 6 repeaters connected to it. This local node also allows us access to the MyGMRS national linking network hosted by the owner of this site. By entering commands in Asterisk or using DTMF, links to other systems can be connected or disconnected on the fly. Things like usage counters and the visual map show links with red lines as well as what site is transmitting by changing its marker from green to red, all of this in real time. Its not as hard as it sounds, Rich from MyGMRS was a huge help, you can also find a linking thread in the private section here. Along the way I found a company that was able to build a custom cable for interfacing the MTR2000 with the RTCM, it provides a reliable solution that's repeatable and works flawless. The MTR2000 repeater can be configured to work with the RTCM rather simply using the repeaters wire-line card to handle the audio and the 96 pin J5 connector to pull ctcss, core, ptt and power. We are using the RTCM and MTR at 6 sites with a stand alone MTR at a 7th and could not be happier. These machines are worth every penny, its not 2 mobiles in a box its a true full duty cycle, commercial grade repeater. Due to the simplicity I have several more RTCM / MRT2000 combos ready to go I just need to fined a few more tower sites with internet. Hope this answers a few questions. If you are new to GMRS and radio all together.... keep in mind many who have been at this for years in all forms of radio have a "common sense" approach to things...goes with that "spirit" of the rule type deal. There are 20 guys a day that get into GMRS and think they have found some incredible new discovery in capability that no one else has thought of....but it isn't practical, isn't legal, and doesn't meet the common sense test. Just wishing a merry Christmas to all my friends on the forum. Hello everyone. Been lurking here for a couple of weeks before registering. I recently received my GMRS license. Was surprised to have it issued within a day of submitting everything online. I've been a licensed ham since 2001 as well. I have a family that doesn't mind using a radio but asking they are not interested in getting a ham license. Figured we could use GMRS and have better results than the cheap FRS radios we have used in the past. Plus it gives me another radio to play with. I'm now off to post a question in the technical section. Thanks for having me.